4,135 precast concrete components, 400 Deltabeams, 4,035m³ of reinforced structural concrete and 250 structural steel units. PCE’s Hybrid floor plate design enabled flat soffits thus simplifying M&E services fit out whilst enabling flexibility in partitioning and use of floor space. Structure designed and constructed to achieve a very low Vibration Criteria of A(VC-A), whilst pre-glazed external precast concrete sandwich panels were used with a high class of architectural finish. The onsite construction programme was 20 weeks faster than the original insitu concrete scheme proposed and with a reduced workforce over 2,500 site operative weeks were saved. PCE Ltd has an enviable track record of working with the Kier Group on large scale projects, from developing the superstructure design during the tender processes, through to successful completion on site of complex offsite Hybrid projects. It is not surprising therefore that for a new large multi-storey laboratory building called Capella, to be constructed at the Addenbrookes Hospital site for Cambridge University, Kier chose PCE as its superstructure construction partner. 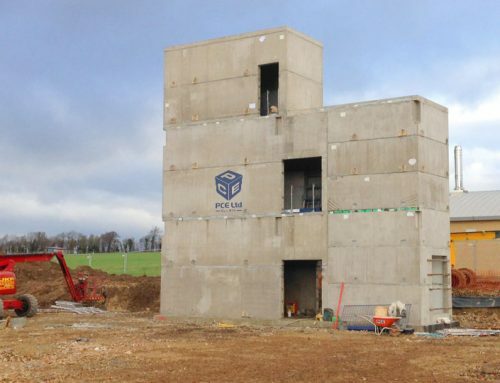 Following initial contact from Kier, an offsite hybrid solution was conceptualised and commitment was received by PCE to start finalising the design – as well as enabling the casting of precast components to begin prior to the building erection getting underway. The building was designed to provide world class scientific and research facilities with a stringent requirement to minimise vibrational effects when occupied and in use, due to the very sensitive scientific equipment that is being installed. PCE’s approach has embraced this and by using BIM techniques has allowed the integration of an extremely complex services strategy. This includes the pre-installation of the main services routes and package plant along with the integration of a precast facade solution with pre-installed glazing. The resultant structural frame design adopted is generally precast columns with a combination of precast concrete edge beams and structural steel Deltabeam spine beams, supporting 300mm deep hollowcore planks and a 200mm reinforced insitu structural concrete topping. The structure was built using two cranes on a confined site with a relatively small footprint between two existing and in use facilities. PCE delivered the 7 storey superstructure with suspended flooring of approximately 17,000m², as well as erecting the 5.0m deep basement walls and external envelope, in just 8 months of site activity. The PreFastCore lift shaft and stair cores were used to provide the frames structural stability and were constructed to full height using volumetric concrete box modules at the start of the erection process – giving a significant time saving and providing safe access and egress to those on site to the buildings floors when they were being erected. 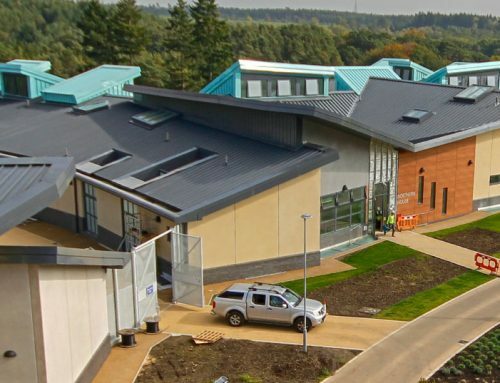 Never before had a bio-sciences research and development facility been constructed with the use of a precast:insitu offsite Hybrid methodology. Project Capella was transformed from blank piece of paper to an enclosed building in 24 months. Finite element analysis along with specialist vibration analysis software was utilised to model the structure and the stiffness of the floor plates to develop an appropriate composite slab arrangement. This coupled with the benefits of constructing the superstructure in its entirety, including façade, from basement slab to roof resulted in a level of optimisation never seen before in this sector. June 2017. PCE/Kier – Commendation, Offsite Awards, Best Hybrid Construction Project. June 2017. PCE/Kier – Winner, Construction News Awards, Supply Chain Excellence. March 2018. PCE – Winner, Offsite Awards, Best use of concrete. March 2018. PCE – Winner, Offsite Awards, Winner of Winners. May 2018. Concrete Society Magazine – A shining example of modern concrete construction. Precast concrete construction – this is what can be achieved in 105 days! Capella update 2 – first precast wall panel – only 4,134 units to go!